It's that time again, folks...time for another fun Secret Recipe Club reveal! This month, my assigned blog was Life of a Modern Housewife. I looked through her recipes and tried to decide which one to make...then I saw her Jalapeno Cheddar Cornbread and knew I had found what I was looking for. I live in Texas, where cornbread is basically its own food group...so this was perfect! Hard to believe, but this was my first time to make cornbread from scratch since we normally use a pouch mix to save time. This cornbread was SO GOOD...very moist and sweet. I made a few changes to the recipe, ending up with Hatch Chile-Bacon Cheddar Corn Muffins. This was a delicious addition to a supper of grilled sausages served over spicy orzo. I opted to make muffins instead of a pan of cornbread since it's just two of us here at Casa Garcia. That way, we can use the rest for Sunday brunch and afternoon snacks. They also freeze very well in a sturdy freezer bag. 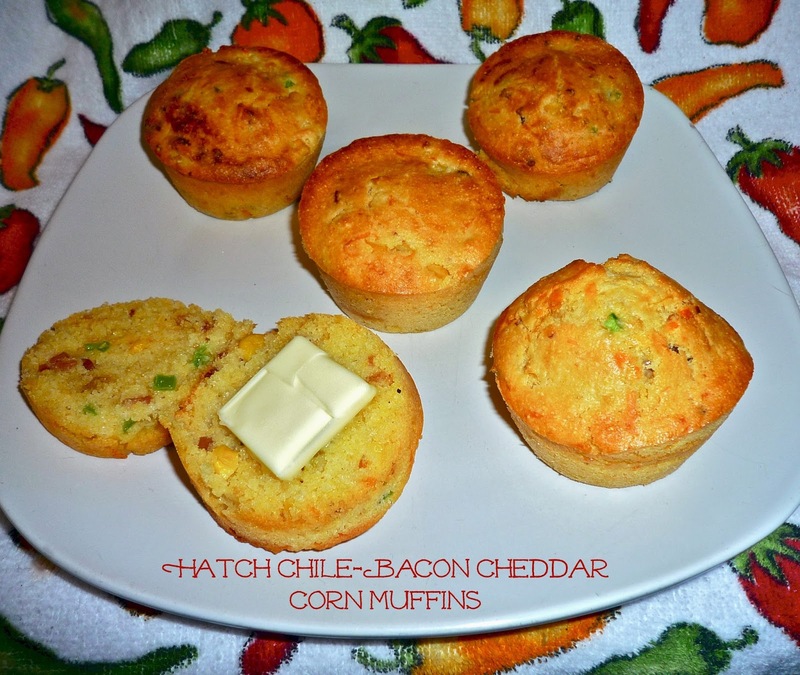 Other changes I made include subbing in-season Hatch chiles for jalapeno and adding bacon and corn kernels to add extra flavor and texture. These are so easy to make, and they bake up moist and golden brown! 1. Preheat oven to 375; spray a non-stick 12-cup muffin pan with Pam and set aside. Melt the butter in a large measuring cup via the microwave and set aside to cool. Add the dry ingredients to a large mixing bowl and stir to combine. Add the buttermilk and eggs to the reserved butter in the measuring cup; whisk to combine. Add the wet ingredients to the dry and stir just until combined. 2. Add the bacon, cheese, corn and Hatch chile to the bowl and stir just until all the ingredients are evenly incorporated into the batter. Use a cookie or muffin scoop to evenly divide the batter into the muffin tins. 3. Bake until golden brown, approximately 30 minutes. I like to rotate the pan in the oven halfway through baking to ensure even baking and browning. Let the cooked muffins rest in the pan for 2-3 minutes before removing them to a serving plate. You can eat them as is, but I love to split them and add a pat of butter! These corn muffins are fabulous! They're crunchy on the outside and moist on the inside. The combination of spicy chiles, sweet corn kernels and smoky bacon combines really nicely with the earthy cornmeal and savory cheddar cheese. These hearty muffins would be the perfect partner for a big bowl of chili or soup, so I can't wait to make them again when soup weather eventually arrives in Texas! Please make sure to stop by and check out all the great recipes my fellow SRC members are sharing today; there's sure to be something that you'll want to Pin to make very soon!